Tag or be tagged in the intense, real-life lazer combat game - Two-Player Lazer Tag Battle System! The complete two-player system includes two Phoenix LTX taggers for thrilling minute-to-minute action as they register hits with special weapon activations that feature lights, sounds and vibrations! The rumble pack in the Nerf Two-Player Lazer Tag Battle System that lets you know when you've been hit, while the recoil feature engages with every shot fired. There's also a shield to protect yourself from incoming fire! Line up your shots with amazing accuracy! Invite your friends to join you in multi-player modes (additional taggers sold separately) and watch your back or be tagged! 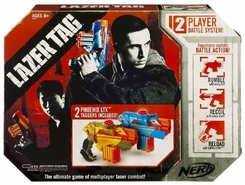 With Nerf's 2PK Lazertag System, you can finally have your own intense laser battles at home with your friends! Designed for ages eight and up, the PHOENIX LTX taggers have plenty of movement and sounds to keep your battles exciting and interesting. Your gun rumbles, recoils, and reloads while you zone in on your opponent and aim for the score. Fun factor: Durability: Ease of assembly: Educational factor: The Good: Plenty of interactive sounds and vibrations. The Challenging: The guns could break if dropped repeatedly. The guns are colorful and have a classic Nerf look. View larger. Fun Lights, Sounds, and Vibrations To start the game, simply push the side power/game type switch. Be sure to agree on a strength level with all players before starting, because it cannot be changed once the game begins! The two guns are equipped and ready for battle with a rumble pack vibration that lets you know when you've been hit, a recoil feature that is activated with every fired shot, and a force-field style shield that will protect you from any incoming fire! The shield gives you that extra couple needed moments to aim with precision, and help you hit your target with accuracy. As a side note: We recommend always holding your gun with both hands since they are heavy and could break if dropped repeatedly. Fun For All Ages The taggers are colorful and outfitted with so many neat sounds, lights, and vibrations, even the adults will be trying to join in on the intense laser battling fun. The shield is such a great addition to the PHOENIX LTX's as well, giving players an extra chance to load up and aim, or get away during a heavy pursuit.